Happy Friday! Those two words are music to my ears this week, and if you're week has been anything like mine you're probably ready for some down time - and a freebie! Are you ready for St. Patrick's Day? This freebie will help get you there. 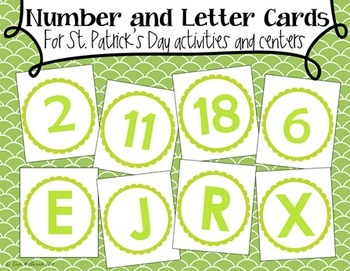 These letter and number cards will turn any activity into a St. Patrick's Day activity. Use these cards with any of the letter or number activities that you already have planned, or check out my Language Arts pinboard for more ideas!